The micro pavé setting is one of the more difficult of techniques for setting small diamonds. The micro pavé setting requires use of a microscope and exceptional hand-eye coordination. The array of diamonds closely knit and usually adjacent results in dazzling continuity of diamonds with minute prongs, barely visible to the naked eye. 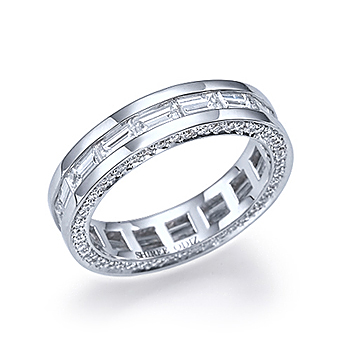 Diamonds can be set with the pavé setting part around the ring - usually 1/2 to 3/4 the way round or can be set all the way around. 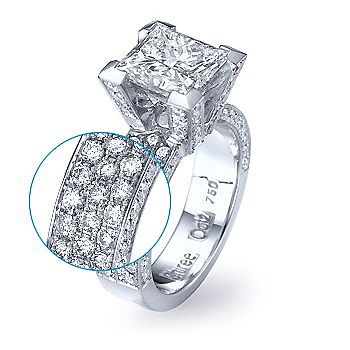 The advantage of having fewer diamonds and leaving a plain area of metal is for future resizing. The bezel setting is a diamond setting technique usually used for medium to large size diamonds by surrounding the stone with a usually thin perimeter of the chosen metal. 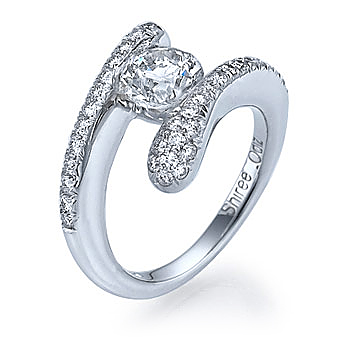 Often, the bezel setting itself is pave set to create an effect of a larger center diamond. This setting is the most secure possible setting for diamonds. In recent years, the bezel 'halo' setting, with small pavé set diamonds around the main diamond has become one of the most popular settings after the prong setting. 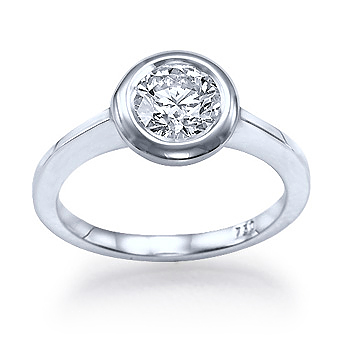 The halo design beautifully accentuates the main diamond and adds an elegant touch of sparkle. 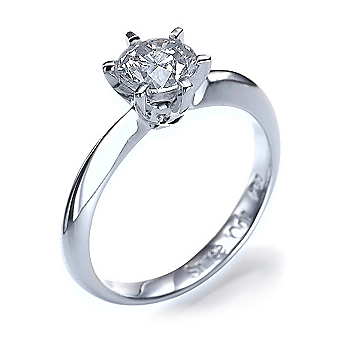 The prong setting is by far the most popular choice for setting diamonds. The most common options are 4 and 6 prong settings, where a ridge in the gold is made for the diamond to be tapped into professionally. One type of prong setting is the 'basket' setting, where the prongs are linked together with thin horizontal bars, creating a basket shaped center-piece, to hold the prongs and the diamond securely in place. The tension setting is one of the more precarious of settings, using a combination of tiny ridges in the metal and pressure to hold the stone in place. Well made tension set rings will have a security bar to ensure that the diamond cannot come loose even if accidentally knocked. The tension setting allows for alternative and avant-garde designed rings with the main diamond showcased from all angles. Channel set diamonds create a smooth array of diamonds, touching edge to edge in a channel of gold or platinum. Channel settings require perfectly matching sized diamonds and in especially in the case of baguette and princess cut diamonds, the cut of the diamond should also be matched so that the facets of all the stones are nicely aligned. Resizing a channel-set ring is a significant challenge, particularly if the diamonds are set all the way round. In many cases, making a new ring would be required if the size change is more than minimal.